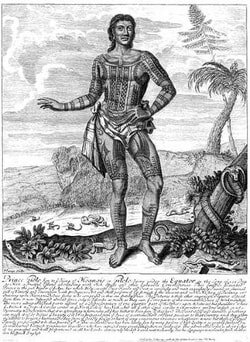 --The first people Magellan saw when he landed on Homonhon Island on March 17, 1521 had tattoos. He referred to them as “Pintados” (“Painted”). In fact, the Spaniards referred to the archipelago as “Las Islas de los Pintados” (“The Islands of the Painted People”). . .
Pule and his younger brother, Legleg, were part of a contingent of boys that was performing a monumental task during that particular evening. They were aiming to accomplish the final steps toward manhood. The elders had let twenty of the tribe’s future hunters to walk into the claws of the night and into the dark bosom of the jungle in search of wild pigs. It was customary to teach the youths how to use the “sibat” ( lance) and the “gulok” (a bladed weapon similar to a butcher knife, only thinner and longer) in capturing wild pigs, dead or alive. The men of the village had been able to sustain the survival of the tribe through the sheer skill in the use of the said weapons, coupled with physical conditioning and cunning. A “dallung” or feast awaited the arrival of the young hunters when each one came home with a catch late in the following day. A day later, the brave, young men who had already proven their worth received their very first tattoos. The tribe had one elderly man who was the master of tattoos. He was referred to as the “mambabatek”. A female tattoo master was referred to as “manfafattong”. A tattoo rite was preceded by the worship of the ancestors and the offering of animal sacrifices. Another village elder referred to as the “hinahanghal”, who wore a tattoo on his throat symbolic of his having a golden voice, sang petitions to the “anitos” (spirits of the ancestors) to protect the tattoo recipients from infection. Older men and women in the village, on account of their ages and experience, bore more tattoos on their bodies and limbs than their younger counterparts. There were tattoo symbols for dogs. These represent fierceness and watchfulness, the special traits of dogs. There were tattoos shaped like mountains and layers of mountain tops meant multiple acts of service or bravery. There were tattoos in the shape of the centipede, which became protection against poisons. There were tattoos that looked like falcons or eyes – these tattoos were given to tribe members who could see beyond and communicate with the spirits in the afterlife; “minminata”, they were called. “Chak-lag” was the ultimate form of honor. It looked like a shield and it was tattooed on the surface of the entire chest of the ultimate warrior. There was also an honorary tattoo for the “kadangyan”, the blue-blooded and wealthy member of the tribe. The women wore tattoos on the inner part of their thighs, the pathways, as newborns come out of the mothers’ portals. The purpose of these tattoos was to ensure successful childbirth. treading an unfamiliar path along the edge of a cliff when, unexpectedly, Legleg slipped off a loose, slimy patch of dirt and fell off the edge. He was able to hang on momentarily to a stub of a tree that was sticking out of the cliff’s edge. Pule froze in fear. His immediate reaction was to save his brother, but he knew he was ill-equipped to do so. He had no rope that he could use to pull him up with, that was, assuming that he had enough power to pull him up. All he had was the “gulok” and the “sibat” that had a long bamboo pole for a handle. He thought of dangling the lance’s long handle as a hitch; but he hesitated. If he used the lance to pull up Legleg, either Legleg could hang on to it and be pulled up; or he, Pule, could be pulled down off the cliff and both of them would fall into the deep chasm, he thought as precious seconds ticked off toward a heroic rescue or a major disaster. And the inevitable happened. Pule decided that using the lance would not work. Legleg could not hold on to the stub any longer and he let go. He fell like a rock into the dark, empty space. was starting to break when the men finally retrieved Legleg’s dead body. The young hunters came back with a good catch, but instead of having a celebration, the village observed a day of mourning in honor of the dead. Each of the young man came back with a catch and would surely earn a tattoo. Pule brought home the mangled body of his brother. Time passed on and Pule developed into a full-grown man. He grew up carrying in his heart the burden of guilt and deep sadness for losing his beloved brother. He was being blamed regarding the accident that befell his brother. He put up with the blaming and the villagers’ cold treatment of him. Coward! Everyone thought he was. The young maidens of the village avoided him. The young men did not want him in their hunting parties and battles. He had no trespassers’ heads to bring home. His life had no meaning. He had not even one tattoo in a society that looked up to tattoos as proofs of manhood, valor, victory, and honor. Pule decided to leave the village and headed for the plains; in fact for the big city, and started a new life. Already, the Spaniards were in power in the Philippines at that time. They were in control of the government and the church that was proselytizing Christianity. In the mountains, the Spaniards were being beheaded by the tribal warriors. It was ironic how Pule’s fate had reversed completely –the Spaniards whose heads were being sought after by his peers were the ones that had opened their arms to him, adopted and supported him in a society “more advanced and more humane than the society where he came from”. Pule’s education was financed by his adopted parents. He took up pre-medicine and became an assistant to a specialist. Although he did not become a full-fledged doctor, the experience he gained working for the specialist, had given him enough credentials to provide sufficient medical service. Early on, Consuelo, his girlfriend, and Pule had agreed to get married as soon as his medical career took off. She now asked him to go ahead with their plans of marriage. However, Pule had other plans, and decided to put off the marriage. He also opted to give up a lucrative job at a hospital in Manila and decided to go back to the Cordilleras to be with his beloved people once again. traditional wear, the so-called, G-String. The reception to Pule was cold. He heard remarks like, -- Why did he have to come back? -- People were avoiding him. And when he saw people having conversation he knew they were talking about him. Pule led a solitary life. He kept to himself in the hut that gradually began to look like a clinic. He was grateful every time a villager knocked on his door to seek medical assistance. He welcomed each one with warmth and respect and provided them with treatment and medicines, free-of-charge. The elders, the wise men of the tribe, and the traditional medicine men became upset. The heretic! Introducing new medicine! The “anitos” will be offended! A tragedy will befall the tribe because the Laws of Nature have been violated. They protested. People who became well after being seen by Pule had petitioned the elders to give him the freedom to serve those who wanted to be served. His sympathizers had grown in number. However, there was one unfortunate incident. One girl’s condition was so grave she could not be saved. Pule could not perform the needed surgery for lack of the proper equipment. The child died and Pule’s reputation got tarnished again. A band of angry men with tattoos stormed into Pule’s house, tied his hands behind his back, and dragged him into the jungle. The men took turns in punching and kicking Pule, striking his head and body with blunt objects, and spitting at him, as he laid on the wet ground motionless. They eventually left him, dead they believed, for the wild animals to feast on. women, inside a house. The women picked up the unconscious Pule after the angry men left him for dead. They carried him into a safe place and alternated tending to him until he regained consciousness. Pule had lost the opportunity to be married. Consuelo, his sweetheart in the city, could wait no longer and married another man. On the other hand, the women in the village, for fear of being censured by the rest of the tribe, did not want any relationship with him. A majority of the villagers could not forget what happened at the wild pig hunt that took the life of Legleg. They could not forget nor forgive Pule, “kahi’t pumuti na ang uwak“ (a saying about not forgiving even if it took forever – “even if the crow turned white”). They treated Pule as if he were a walking dead, a piece of stone, an old tree, that was in their midst but who had no voice, no value, no feelings, no significance in their lives. Still, Pule persevered in the village; he continued to serve those who came by for treatment until he advanced in age. As days and months and years passed on, the number of people who learned to love and respect him had increased significantly. A few more years passed on. Pule could feel his body was getting older. He knew his days were numbered. One night, in a dream, he saw Legleg standing on an island and waving a hand at him. The wind brought to his ears Legleg’s words. the appropriate tattoos on their bodies. The sun was fading away in the Cordilleras. The pitch darkness of the night came spreading across the land like a black veil of mourning. Inside one of the houses, that stood high on stilts atop the ground following tradition, the elders gathered around the old man lying face down on a straw mat. a lake. The tattoo was the recognition of the man's goodness that, tragically, had been overshadowed by a grim incident, one single incident that had rendered his whole life bitter and miserable. he wore the badge of honor, the appropriate tattoo.